Last Thursday afternoon, Gideon’s crying changed. His screaming was more shrill than usual, and he was inconsolable which is not like him. My mother in law pointed out that he was holding his hand up to his right ear, and I knew. My poor 2 month old baby had an ear infection. At first, I feared swimmer’s since he has gotten water in his ears during bath time before. But turns out it was a middle ear infection that he had never shown any warning signs of, not even a fever. I have had fever maybe four times in my life, and I think my son inherited the same issue. So I had no way of knowing his poor ear was infected, until the infection had advanced enough for him to be in pain. Fourteen 2.5 mL doses of Amoxicillin later, he is finally recovering and back to his old self. All this to say, it’s all Gideon’s fault I haven’t blogged lately. I don’t ever want him to get sick again, but the honest truth is that caring for him was my pleasure. Can you keep a deep, dark secret? I loved the extra snuggles. This is what we’ve spent our week doing. We visited Trader Joe’s for the first time on Tuesday, and I really enjoyed it. Some prices were comparable to Kroger’s, but some items such as cereal, meats, and most produce seemed much cheaper. I’m planning on making an itemized spreadsheet comparing Kroger and Trader Joe prices. Sometime in the next week or so, I’ll post a link to the spreadsheet for you to check out yourself. Let me know if you like the idea, or if you’d like me to add any specifics. I also welcome any resources in grocery savings that you might want to share with me. I hope all you mothers out there had a happy day, and that your families reminded you of how special you are to them. One of my favorite things about being at church this morning was hearing what everyone’s lunch plans were. Some people were having dinner at their kid’s houses, others were being taken out to their favorite restaurants. Either away, all the mothers I know had extra big smiles on their faces. Today was my first mother’s day. I know I’ve been a mom for a little over 2 months now; but being a mom, and being recognized for being a mom on the holiday that actually celebrates motherhood is different. It’s seems strange to be congratulated for being a mother. At the same time, it makes total sense. Being Gideon’s mother is the biggest life reward that God could give me, and people are usually congratulated for receiving rewards. Some people get ribbons when they receive rewards. 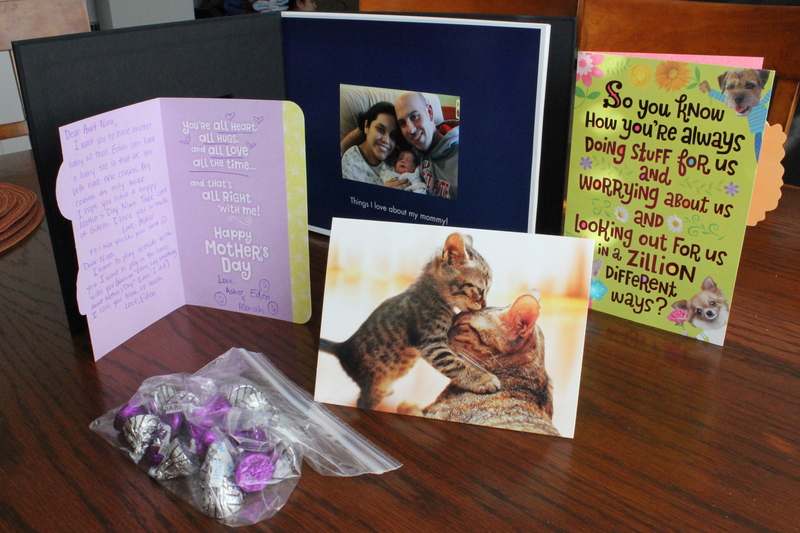 I received a photo book called “Things I Love About My Mommy”, a precious card from my boys, a precious card from my niece and nephew, and a bag of hugs and kisses from my mother-in-law. Aren’t they just adorably hilarious? Mom, I love you. I would be a mess without you. Did I say I love you? As part of our bedtime routine, I say a prayer while Gideon nurses on one side. Then I burp and swaddle him, and sing to him as he nurses himself to sleep on the other side. Daniel led the bedtime prayer for the first time, and it was one of the most touching things he’s done yet. And he’s done lots of heart-warming things over the last two months. On top of that, as soon as I started singing a spanish lullaby to Gideon that he’s known since the womb, he released his latch and relaxed his entire body on my lap. A drop of milk trickled down his cheek. I am just enraptured by him. I guess God just likes to push my buttons, because I have a hard time putting Gideon down to sleep in his crib at the end of the day. I’ve been tempted to crawl into the crib with him. I had the BEST Mother’s Day. The end. Because all of Gideon’s play dates so far have included him and some pretty lady babies! Gideon and Cameryn. Neither is sure what to think of the other. Vera, Gideon, and Grace. In that order. Over the past few months, a lot of friends around me have had babies and are learning to be moms alongside me. There is nothing more fun and validating than discussing new mommy issues with new mommies like myself. “Does such-and-such happen to you?”, “Yes! All the time!”. “What are you doing about such-and-such?”, “Oh…such-and-such seems to work for now.”, “That’s a great idea! I’ll try it!”. If I only had one single piece of advice for a new mom, just one, I would tell her to surround herself with a good support system – people who will encourage her and support her through everything. A new mom needs people who will remind her that she’s brave and strong through breastfeeding, through sleep deprivation, through back pain and muscle tension. A new mom needs her family, spouse, and friends to be there for her. Furthermore, a new mom needs to let her family, spouse, and friends be there for her. So much of what culture tells us as new mothers nowadays is that we should be able to take care of everything on our own. Media shows the mother looking perfectly groomed, using a product to clean an already spotless room. The world sets a bar for us that is unlikely if not impossible to reach. As a result, you have women who feel inadequate, insecure, and question their effectiveness as mothers and homemakers. Everyone and their dog has the answer to all of your questions, and you are simply incompetent. But the truth is this: dust particles are ever present in the air, most of us don’t have a staff that will meticulously remove every particle from our home, and no one knows your baby the way you do. No one. Surround yourself with people who remind you of this, and you will get through whatever test or trial you are going through. A lot of things have happened since I last checked in. Let’s see. What has happened since Valentine’s Day. Well, my cousin Nicole came to visit me all the way from Argentina for a few weeks (it was our high school graduation gift to her) and we took a little trip to Chicago where I got to stay right off the Magnificent Mile, and visit Millennium Park for the first time. I had a beg bug infestation scare in my own home (a false alarm that sent me straight into panic/bawling mode). My parents came to see Gideon the day he was born, only Gideon had a plan of his own and my parents had to extend their stay. Gideon was born, of course. March 8th at 12:56 AM – a date and time I will never forget. My liver decided to stop working, and I went into eclamptic convulsions hours after he was born, and I proceeded to spend the first few days of Gideon’s life away from him in the ICU, getting blood transfusions and lots and lots of pain medications. 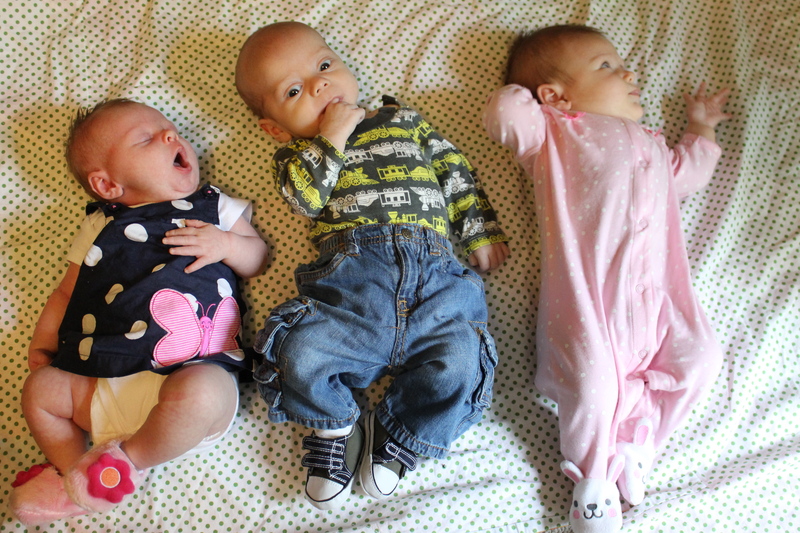 The first two to three weeks of breastfeeding were a nightmare. The only reason I’m still a breastfeeding mother is only because I was surrounded with people that didn’t let me quit (you know who you are!). I have watched a human being in his most basic form grow and develop right before my eyes, day in and day out, into a smart, strong, sweet baby. I don’t think I’ve ever been more changed between blog entries as I have been between February 14th and May9th. On February 14th I was a pregnant woman, and had no idea. Today, May 9th, I am a new mother who still has no idea. So really, all that’s changed is that my life now revolves around a baby. I always have no idea, and spend a great amount of time feeling around in the dark – hoping I’m getting somewhere. All I can say is that I’m glad God knows where He is going, because I rely on His hand through all this. I don’t have the energy at this moment to delve into the depths of what motherhood means/is/seems like. But if I didn’t bite the bullet so to speak, and write this initial entry, it was never going to happen. 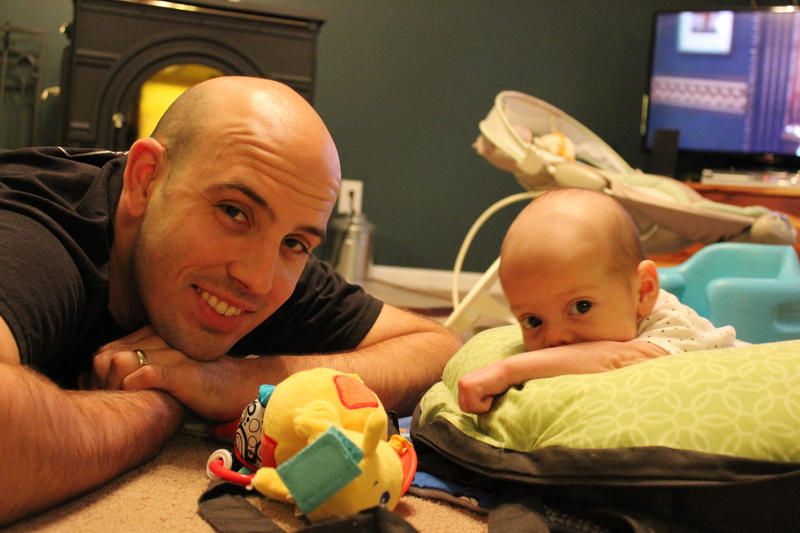 Ever since Gideon was born, I knew I wanted to reopen my blog, and gear it towards everything in my life from reviewing different products I use with him, to rambling on and on about whatever is on my mind at any point in time. I actually have a notepad sheet full of ideas of blog entries, and I’m really excited to get cracking. But not tonight. Tonight Daniel and I are going to enjoy our little bowl of ice cream, TV show reruns, and a decent bedtime. For now, here’s a picture of Daniel and Gideon getting some quality tummy time in.